Dinwiddie Court-House, March 31, 1865. GENERAL: The enemy’s cavalry attacked me about 10 a.m. to-day on the road coming in from the west and little north of Dinwiddie Court-House. This attack was very handsomely repulsed by General Smith’s brigade of Crook’s division, and the enemy driven across Chamberlain’s Creek. Shortly afterward the enemy’s infantry attack[ed] on the same creek in heavy force and drove in General Davies’ brigade, and advancing rapidly gained the forks of the reads at J. Boisseau’s. This forced Devin, who was in advance, and Davies to cross to the Boydton road. General Gregg’s brigade and General Gibbs’ brigade, which were toward Dinwiddie Court-House, then attacked the enemy in rear very handsomely. This stopped their march toward the left of our infantry, and finally caused them to turn toward Dinwiddie and attack us in heavy force. The enemy then again attacked at Chamberlain’s Creek and forced General Smith’s position. At this time Pennington’s and Capehart’s brigades of Custer’s division came up an a very handsome fight occurred. The enemy have gained some ground, but we still hold in front of Dinwiddie Court-House and Devin and Davies are coming down the Boydton road to join us. 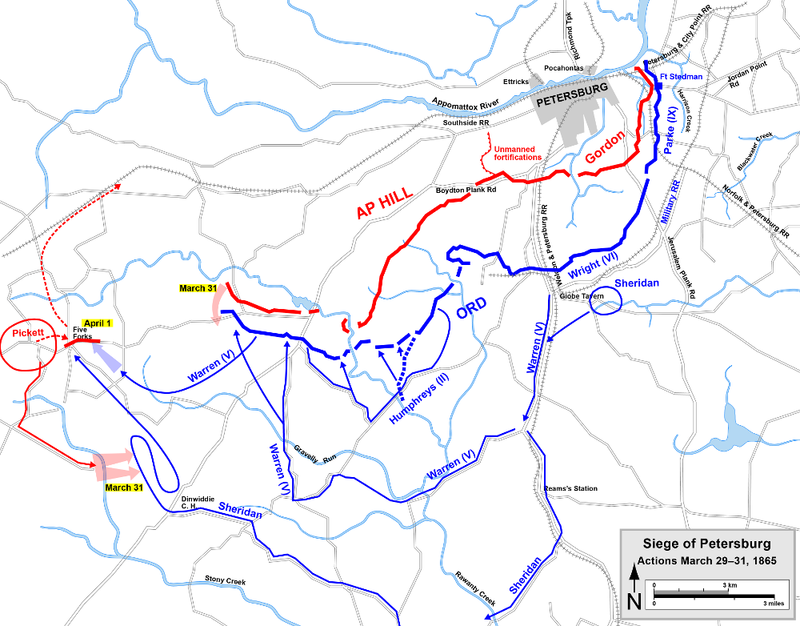 The opposing force was Pickett’s division, Wise’s independent brigade, and Fitz Lee’s, Rosser’s, and W. H. Lee’s cavalry commands. The men have behaved splendidly. Our loss in killed and wounded will probably number 450 men; very few men were lost as prisoners. We have of the enemy a number of prisoners. This force is too strong for us. I will hold on to Dinwiddie Court-House until I am compelled to leave. We have also some prisoners from Johnson’s division. P. S.-Our fighting to-day was all dismounted. DABNEY’S MILL, March 31, 1865-10.45 p.m. The Fifth Corps has been ordered to your support. Two divisions will go by J. Boisseau’s and one down the Boydton road. In addition to this I have sent Mackenzie’s cavalry, which will reach you by the Vaughan road. All these forces except the cavalry should reach you by 12 to-night. You will assume command of the whole force sent to operate with you and use it to the best of your ability to destroy the force which your command has fought so gallantly to-day.